Last September at the Musikfest Berlin 2011 I attended a splendid concert at the Philharmonie performed by the Berlin Philharmonic Orchestra under Andris Nelsons. For those who don’t know about Kaminski’s life a short biography may prove helpful. He was born Germany in 1886 at the town of Waldshut-Tiengen on the banks of the Rhine. Situated on the edge of the Black Forest this town is very close to the German/Swiss border. Kaminski was considered one of the finest composers of his day and numbered Arnold Schoenberg among his admirers. Although largely forgotten today one of Kaminski’s greatest successes was having his score Dorian Music performed by the Berlin Philharmonic Orchestra under Wilhelm Furtwängler in 1934 at the Alte Philharmonie, Berlin. His mother was a singer and his father was the son of a former Old Roman Catholic priest who had resigned from the priesthood after the First Vatican Council of 1869/70. Originating from Poland the Kaminskis had Jewish roots, a factor that was later to cause Heinrich severe difficulties. Kaminski studied in the cities of Bonn and Heidelberg and initially politics was his subject. After Martha Warburg became his patron he moved to Berlin and transferred his attentions to music. In 1914 the penniless Kaminski found himself in the Bavarian town of Ried, near Benediktbeuern outside Munich where he was to marry Elfriede Jopp, a singer from a Munich choir. There they raised a family with Heinrich teaching the piano and composing. Some years later he won the Beethovenpreis and the next year the Musikpreis in Munich. In 1930 he replaced Hans Pfitzner as professor of composition at the Prussian Academy of Arts, Berlin with the best known of his pupils being Carl Orff. A year later, in what was a period of many successes, Kaminski was appointed to the position of State musical director in Bielefeld. Some of Kaminski’s personal letters were intercepted by the Gestapo and fearing deportation to a concentration camp he fled to France and Switzerland only returning to Bavaria when he felt the danger had passed. Subsequently he was declared a half-Jew and in 1938 his music was banned for a time. A humanist and pacifist, Kaminski found that many of his supporters including influential conductors, such as Bruno Walter, had been blacklisted by the Nazis or were facing suppression. In 1941 his own blacklisting was lifted when it was established that he had only one fully Jewish grandparent. Kaminski heavily bore the horrors of the Second World War in Germany suffering the death of three of his five children, becoming separated from his wife who had moved to Munich, experiencing financial difficulties before finally succumbing to an acute illness. He died in his beloved Bavaria in 1946 at Ried shortly after completing his opera King Aphelius. The first of the four Kaminski discs for review is a new release of the String Quintet in F sharp minor. Here we have Schwarz-Schilling’s arrangement for chamber orchestra. Started in 1914 this substantial four movement score, dedicated to Bruno Walter, was completed in 1916 and premièred at the Munich museum the next year. Kaminski was to revise the quintet in 1927 and then gave his pupil Reinhard Schwarz-Schilling the task of arranging it for string orchestra. Subsequently the work was premièred in 1929 under the title of A Work for String Orchestra. This is an extremely lengthy score that can hardly be said to overflow with memorable tunes. Kaminski seems to have been more concerned with mood than melody. It is not a score immediately appealing to the listener and would probably require repeated listening to reveal its undoubted qualities. It is not difficult to imagine this predominantly dark and intense material being a reflection of the composer’s reaction to the war horrors raging around him. Marked Adagio - Allegro - Andante the opening movement feels rather involved, almost bipolar in disposition. Its moods swing back and forth between exhaustive-depressive and episodes of calm. The music sometimes feels impulsive with a dash of nervous energy. The tension-filled second movement Andante is redolent of vast open spaces laid to waste. Having something of the quality of the haunted ballroom about it the measured Ländler-like Scherzo marked Allegro is intensely melancholic. Here the writing is heavier yet quicker. There’s considerable tension yet also a more extrovert quality. The Finale is a considerable and rather complex movement - a fugue here lasting around 19 minutes. The writing is characterised by inventive and impressively scored eruptions of energy. The performers make a splendid case for this substantial score and play with impressive string sonority. It feels as if the conductor Skou-Larsen has worked hard on handling detail. Their unity of ensemble is notable too. The CPO engineers have done a fine job and have secured clear and well balanced sound. 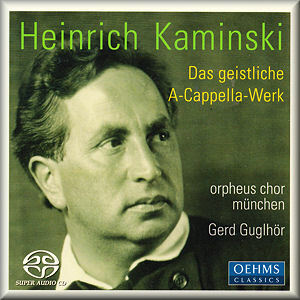 The disc titled Sacred A-Cappella Works on Oehms Classics contains many wonderful delights. This splendid collection spans some 34 years. Immediately I was struck by the beauty of Psalm 130 for soprano solo and chorus (1912). It comes as no surprise that this highly attractive three movement setting is one of Kaminski’s most performed scores. In Aus der Tiefen rufe ich, Herr, zu dir (Out of the depths I have cried, Lord) I loved the glorious interplay between the prominent bright and shimmering female voices against the deep almost whispered resonance of the males. Soprano Priska Eser-Streit is in quite marvellous form in Ich harre auf den Herren (I wait for the Lord) with her beautiful and reverential soprano sending a shiver down the spine. The final movement Israel, hoffe auf den Herren (Let Israel hope in the Lord) sees the mixed choir moving in perfect unison with the weighty textures. A relatively late score from 1934 Die Messe deutsch (The German Mass) for soloists and chorus was left incomplete. The texts are Kaminski’s own and the Nazis would surely have found yhem inflammatory. In two movements the first O wirre Welt! (O bewildered World!) - a Kyrie eleison of a dark and serious character is intense and affecting. In the second movement O Christ eleison (Oh Christ have mercy) I was immediately struck by the gloriously sung duet from sopranos Priska Eser-Streit and Sigrid Plundrich over the Orpheus choir’s soft blanket of sound. Lasting just over 9 minutes Die Erde (The Earth) - Zarathustra: Yasna 29 is a motet for mixed chorus set to a difficult to understand text that Kaminski completed in 1929. I admire the splendid contrasts of mood and broad dynamics between softly calming and weighty dramatic writing. In addition the quickly shifting tempi makes this a challenging proposition which the choir pass with flying colours. From 1930 the Triptychon (Triptych) for mezzo-soprano solo and organ is substantial. It’s demanding for the soloist Roxana Constantinescu and takes some 20 minutes to perform. Each of the three pieces inhabits a rather similar mood. In the first part Zarathustra: Yasna 43 I especially admire the singing of the assured Constantinescu. Radiating a serious character she asserts that there is more than one way to find God – this over a prominent organ part authoritatively played by Harald Feller. She is again in quite glorious reverential voice in the final part Das Wessobrunner Gebet (The Wessobrunn Prayer). There is much to enjoy in the motet Der Mensch (Man) scored for alto solo and chorus. To a text by Matthias Claudius it was completed in 1918. In this testing motet Constantinescu sings a separate set of words to that of the choir. I thoroughly enjoyed the Sechs Chorale (Six Chorales) from 1915. Although each of them inhabits a similar sound-world these are attractive pieces characterised by reverential restraint rather than extravagance. Throughout, the choir is wonderfully secure singing with eloquence and reverence and displaying a most impressive unison. Dating from 2005 the sound is well balanced and stunningly clear. In short this is a magnificent disc impressively sung and recorded. There are some real gems to discover here in this expressive and easily accessible music. The CD on the Telos label titled Music is Confession played by the Swiss-based Casal Quartet offers us an impressive recording of Kaminski’s String Quartet in F major (c. 1913/17). Also included are Schulhoff’s String Quartet No. 1 (1924/25), Ullman’s String Quartet No. 3, Op. 46 (1943) and Busch’s Quartettsatz in B minor (1924). Incidentally, the birth-dates of Schulhoff and Ullmann are given incorrectly on the rear cover of the CD sleeve. 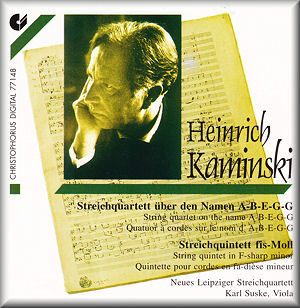 I have not managed to find an exact composition date for the Kaminski’s Quartet but it seems to be from around 1917. The F major score is cast in four movements commencing with a Lento expressivo. Deliberately laboured in pace, bleak and disconsolate the writing is variegated with two short energetic outbursts of petulance. If anything the mood becomes increasingly despairing. Given the date this could easily be Kaminski’s depiction of the horrifying destruction caused by the Great War. Marked Energisch the substantial Scherzo-like second movement is immediate yet feels disconcerting, like a haunted dance. Twice the music slows for episodes of a more reflective nature. At 5:13 an abrupt shift reveals slightly disturbing music of an esoteric quality possibly ironically celebratory. Short at only two and half minutes, the Adagio expressivo - attacca is heartfelt but alters to the disconsolate disposition of the opening movement. The Finale, Allegro deploys previously used ideas and the underlying feeling created is one of disturbing nervous tension. Czech composer Erwin Schulhoff of Jewish origin was aged 48 when he became a victim of the Wülzburg concentration camp in Bavaria. Schulhoff’s String Quartet No. 1 (1925) is a four movement score in the style of a classical sonata. It overflows with varied and fascinating moods combined with rather progressive writing. Utilising Slavic dance figures I especially enjoyed the wild and vigorous opening movement Presto con fuoco in the manner of a speeded-up folk-dance. The second movement Allegretto con moto e con malinconia grotesca contains some beautiful, if edgy, dance music. It all feels rather tongue-in-cheek, employing a substantial amount of eerie harmonics. Another remarkable movement that again uses Slavic dance rhythms is the third movement Allegro giocoso alla Slovacca which is intense and near frenetic. Concluding with an Andante molto sustenuto the poignant writing is serious and tinged with a sense of threat and danger. Viktor Ullmann from Tešín in the Czech Republic was also of Jewish descent. In 1944 aged 46 he was killed in the gas chambers of the Auschwitz-Birkenau concentration camp. A wartime work from 1943 Ullmann’s String Quartet No. 3, Op. 46 is cast in four movements. The opening movement Allegro moderato contains predominately austere writing followed by an energetic and disturbing Presto. The third movement is a Largo that could easily depict a bleak and desolate landscape and the Rondo, Finale is memorable for sharp shafts of restless energy. Far better known as a violinist, both as soloist and chamber musician, Adolf Busch was born in Germany in 1891. Busch was much admired as a musician and founded the famous Busch Quartet and the Busch Chamber Players. Although he had made a stand against Nazism this counted for little after the war; finding that his reputation had greatly reduced. Busch’s body of compositions include a Concerto for Orchestra and a Violin Concerto also the Quartettsatz in B minor (1924). In a single movement this score has three discernible sections Lento- Vivace - Prestissimo and lasts just under 11 minutes. It brims with intense emotion mainly restless anxiety contrasted with devilishly energetic moments. It is hard to fault the Casal Quartet for their taut and resolute readings. Impeccably prepared the deeply musical playing has splendid unity and attractive tonal blend. The sound is cool, crystal clear and well balanced. On the Christophorus label we hear from the New Leipzig String Quartet (now the Leipzig String Quartet). The first score is the intriguingly named Prelude and Fugue on A-B-E-G-G from 1931. Lasting here around eight and a half minutes this single movement piece was a gift to Dr. Wilhelm Abegg in gratitude for his patronage. There’s highly impressive and intense forward momentum here. The music is windswept with a strong feeling of anxiety alongside contrasting tranquillity. The closing Fugue radiates angst over an incessant surging momentum. Kaminski’s String Quintet in F sharp minor (1914/16 ) has been outlined in the above review. I slightly prefer this original version. Here the Leipzig String Quartet is augmented by second violist Karl Suske. In the opening Adagio - Allegro - Andante movement the assured players maintain a firm grip on the tension-filled writing. This only loosens for interludes of uneasy calm. The players maintain that unsettling feeling in the Andante with its substantial central section heavy with foreboding. The stately dance-like figures open a Scherzo that gradually grows in both weight and tension. The substantial Finale - Fugue is splendidly detailed and sharply characterised. The concentration and weight of the playing is remarkable. Having attended a live performance of Dorian Music (1933) played by the Berlin Philharmonic and as further encountered here I have no doubt that Heinrich Kaminski is an accomplished composer with a lot to say. He certainly does not deserve his relative neglect and further quality recordings of Dorian Music will assist his case. 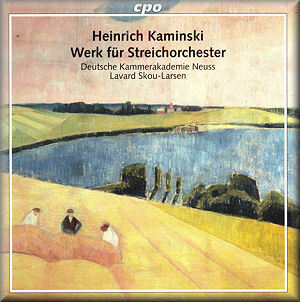 I certainly hope that it isn’t too long before I hear in the concert hall or on disc Kaminski’s final orchestral works from 1942: his Sinfonietta, Dance Drama for orchestra and the Suite for large orchestra. Now that would be something!